My first encounter with Marilyn Monroe was when I was eight or nine years old and the babysitter had allowed my brothers and I to stay up late to watch The Misfits (1961) on our little Black and White TV. I remember clearly a scene of Marilyn sitting in between two men, an ethereal foil for the beat up looking cowboys played by Clark Gable and Montgomery Clift as they drove across the Nevada desert in the unforgiving heat and dust. I don’t remember much else about the plot or even the ending, but I do remember being mesmerized by the beehive on the babysitter’s head as she told me that the beautiful lady on the screen had been found dead in her bed a few years earlier. Since then, I have watched the movie on numerous occasions and learned that this was Marilyn’s (1926-1962) last film. It was Clark Gable’s (1901-1960) last film, too. She had died of an apparent overdose months after the film’s release and Gable had suffered a heart attack shortly after the shooting, purportedly from the strain he had put on himself by insisting that he do all his own stunts. 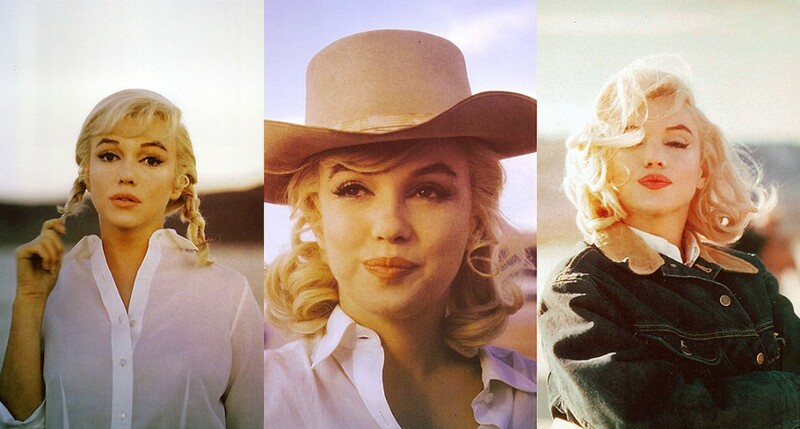 The film is supposed to be about the end of the Wild West and centers around chasing wild horses that would eventually be sold for dog food, but the ensemble acting coupled with Monroe’s ability to depict beauty and strength in a stark environment is nothing short of brilliant and goes much deeper than the Western theme would suggest. What strikes me most about Ros (Monroe) is her ability to appear vulnerable and weak until she sees the freedom of the wild horses in jeopardy. Like a true Animal Rights Activist, she defends the horses, even at the risk of losing her newly found love Gay (Gable). Gay chooses love over profit and sets the horses free. Monroe, who is said to have been unhappy about the film and her portrayal of Roslyn, won a Golden Globe award as “World Film Favorite” in 1961. Written by Arthur Miller (Monroe’s last husband), directed by John Huston, and filmed in Black and White, if you haven’t seen this one, it’s worth the view.